Professor Sherrington with Professor Sergei Glavatskih from KTH Royal Institute of Technology in Stockholm. A University of Central Lancashire (UCLan) academic has been named as the first Professor of Tribotronics in the world. Professor Ian Sherrington, Director of the University’s Jost Institute, was honoured with the title by a top Swedish University at a ceremony attended by around 1,000 people. The conferment ceremony took place in the same location where Nobel prizes are awarded every year, Stockholm Concert Hall. 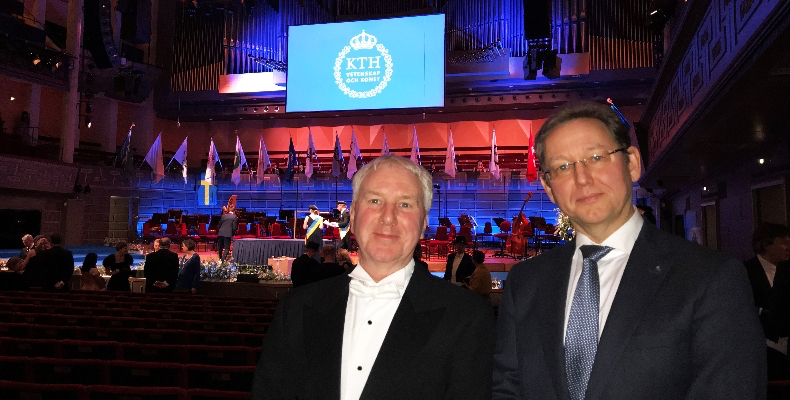 Professor Sherrington was invested as an Affiliate Professor in Tribotronics at the KTH Royal Institute of Technology in Stockholm, one of the top universities in Scandinavia. The appointment acknowledges his leadership in the ground-breaking research in the field of Tribotronics. Tribotronics involves the development of ‘intelligent’ machine components, which are able to adapt their operation in response to their operating conditions. Professor Sherrington and his team of researchers are currently developing a new class of machine parts that can automatically change their operating state under digital control, so called ‘intelligent’ machine components. These devices can be optimised in many different ways. For example, they may change their shape to achieve the lowest possible power loss, compensate for wear or manage fluid leakage. This optimisation contributes to reducing the overall consumption of power and environmental emissions caused by mechanical equipment, as well as giving access to digital data about the operating state of the machine and the chance to upgrade mechanical equipment with new software. In addition to guiding research at UCLan, Professor Sherrington will be working with staff and students in KTH’s Department of Machine Design on a range of collaborative projects on Tribotronics as well as more conventional problems involving friction and wear of machine components over the next three years. The conferment ceremony at the Stockholm Concert Hall also saw almost 200 doctorate students receive their certificates and a number of other Professors appointed.